“Accept my sympathy” President Buhari tells APC’s National chairman, John Odigie-Oyegun over Atiku Abubakar’s resignation – Royal Times of Nigeria. 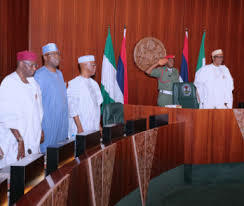 President Buhari has sympathised with the National Chairman of the All Progressives Congress (APC), over the recent resignation of former Vice-President Atiku Abubakar from the ruling party. It could be recalled that Atiku last week Friday, had announced his resignation from the party, describing it as a dying party. He accused the leadership of anti-democratic practices. Although he did not mention any name, it was glaring that he was referring to Atiku Abubakar’s resignation.